Have you seen these incredible Mickey Ear ornaments from The Disney Store? There is an entire series of ornaments that includes Space Mountain, Alice in Wonderland and even the Haunted Mansion. 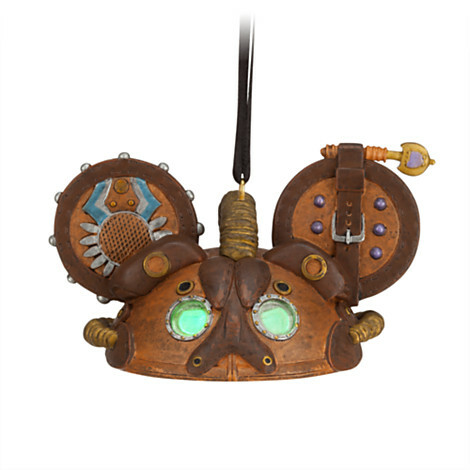 The pictured ornament is a series of steampunk Mickey Ears by artist Costa Alavezos, and this one even lights up! In an effort to prevent me from draining our checking account by purchasing all of the ornaments, I have just handed over my debit card to my husband. This entry was posted in Disney Shopping, The Disney Store, Walt Disney World and tagged Disney Shopping, The Disney Store, Walt Disney World, Walt Disney World Holidays. Bookmark the permalink.